. يعمل Daintree Rainforest Retreat على ضمان إقامة مريحة لضيوفه من خلال خدماته الممتازة وحسن ضيافته. يمكن لضيوف الفندق الاستمتاع بالميزات التالية على أرض الفندق: مرافق مخصصة لذوي الاحتياجات الخاصة, واي فاي في المناطق العامة, صف السيارات, خدمة الغرف, غرفة عائلية . ادخل إلى واحدة من الغرف 12 وتخلص من عناء نهار طويل بمساعدة مجموعة كبيرة من الخدمات كمثل تلفزيون بشاشة مسطحة, غرف لغير المدخنين, مكيف هواء, مكتب, ميني بار الموجودة في بعض الغرف. يقدم الفندق مجموعة واسعة من وسائل الراحة المتنوعة، كمثل: حمام سباحة خارجي. إن كنت تتطلع إلى إقامة مريحة وهادئة في داينتري، فستجد في Daintree Rainforest Retreat بيتك الثاني. Overall it is clean and comfortable and the Manager was extremely helpful and friendly. We really enjoyed our stay at Daintree Rainforest Retreat. The property is well kept and beautiful. We enjoyed using the bbq area to cook our dinner. The pool is very nice to use after a day of sightseeing. Travis was very helpful informing us of everything the area had to offer. room sufficient, perfectly clean . if you dont like bugs dont come to the forrest!! easy walk to afternoon icecream, bar, and short drive to discovery centre. great area for seeing cassowary. free rainforrest walks near by too. met at reception by a friendly man to show us our room, upgrading us as well. thank you. bathrooms are small , but functional.. it this area you get value for money. Travis was amazing. He was so helpful and we couldn’t recommend him enough. Right in the middle of the rainforest. There is so much to do here. The grounds needed a bit of tidying removing dead branches etc. Perfect for a simple stop over. Very clean. Very helpful manager (Travis). Good location for the Discovery centre etc. Good food available at the Cow Bsy Hotel across the road. Lots of information given to us about where to go. Relaxed and good value. I loved our stay in the rainforest. It’s so beautiful. Staff were extremely helpful and communication was easy. Thanks! Beautiful grounds and really nice rooms. The staff were very courteous and helpful with information and booking activities. Highly recommend! Very nice and lovely place , big apartments and clean, fridge and barbecue and gas location outside to cook under a gazebo. No air con but with mosquito net it's also comfortable with open windows . Nice service and helpful suggestions to visit the nearby forest and beaches like wonderful cow bay . Small swimming pool, we stayed one night but two is better to enjoy the rain forest ! Only stayed one night. Lovely to be in the rainforest. Suited the six of us well-wish we could of stayed longer! Would definitely stay here again!!! 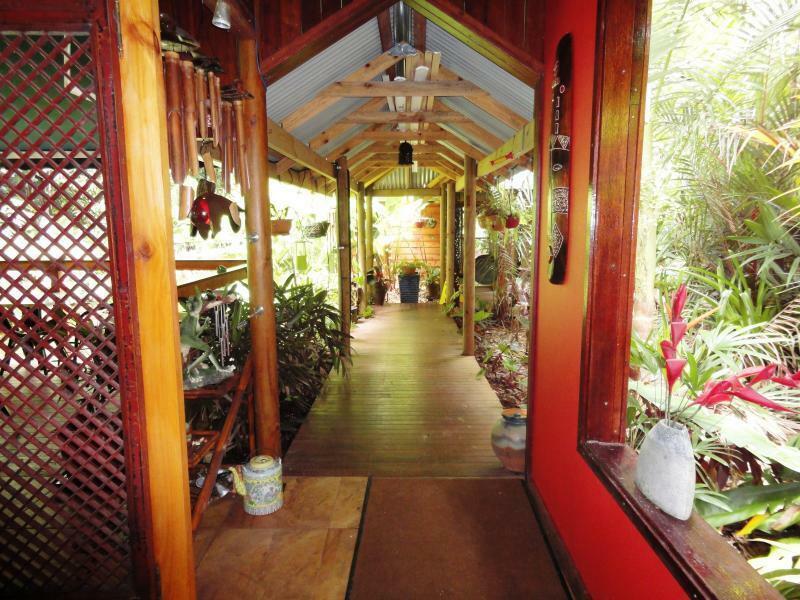 Daintree Rainforest Retreat's staff, Travis was very helpful. He was waiting for us though we arrived at 5+pm. He also recommended us where to eat, to play and to walk. The room was a little small for my family of 5 buy we had a good stay (though it was just 1 night. My children had a chance to see big spiders and frogs in the resort which are rare in my country. They find the place 'exotic'! Good location, out dated facilities - needing an update. Very hot rooms with ceiling fans. Would not stay again. The accommodation was comfortable, clean and quite and so glad we stayed there as opposed to staying in 'town'. Very relaxing and fabulous to just sit and read in the quiteness of the garden. Dinner in the restaurant!!! It is an absolute MUST! Great food, mostly local produce and a a fair price. You have to try it! We loved this place - simple but extremely well positioned for a Daintree experience. Very friendly and informative staff. Generally a wonderful atmosphere to be a part of.